When is the best time of year to visit Tasmania? 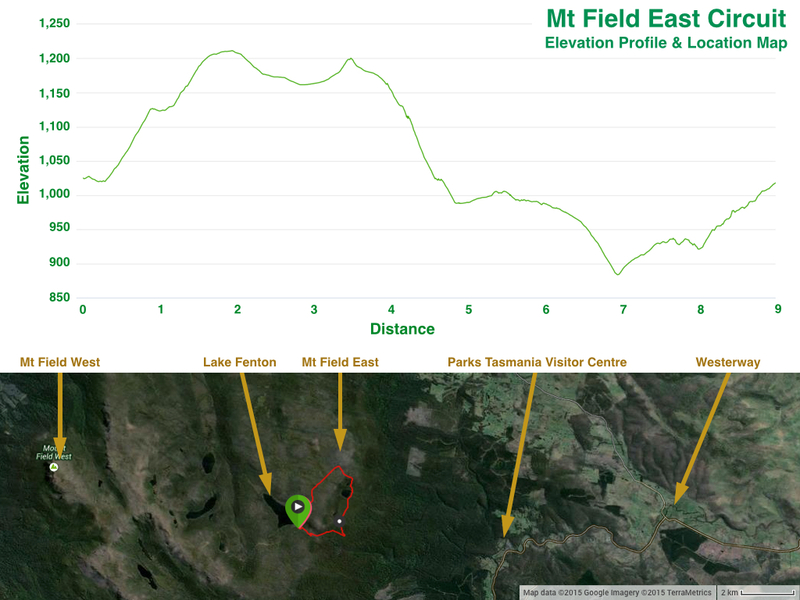 If there’s a way to condense the whole of Tasmania’s famous 6-day Overland Track down to a day walk, surely the Mt Field East circuit has to be it – what’s more, it’s so close to Hobart! Note: National Park Permit required, as with all National Parks in Tasmania; passes can be obtained from the Visitor Centre near the entrance of the park. About the only thing I knew for certain before visiting Mt Field National Park, was that it’s the place closest to Hobart that you can see Fagus – also known as Deciduous Beech (Nothofagus gunnii). We’ve been to Cradle Mountain around Easter time to see it changing colour before, but the question in my mind was: how much harder would it be to spot in summer when it’s leaves are all still green? Of course I’d heard and read interesting things about the park, but unless I have a memory to link them to (e.g. linking the Fagus to a previous Tassie holiday), I find they just don’t stay put. So I just have to go and find out for myself. It’s also much more fun that way. Armed with a Park map as well as Chapman’s Day Walks Tasmania, we thought we’d make a final decision on which walk to do when we got there. Due to a little sunburnt from the Taste of Tasmania festival the previous day – and that was with temps in the low 20’s – and given today was looking like it’d be pretty similar for Hobart, I didn’t pack a heavy jumper, instead planning to rely on my Gortex jacket if it turned windy. By the time we’d made lunch and were ready to go it was already about 10am – not really an early start. Mt Field National Park is roughly a 1 hour drive north-west of Hobart, along the River Derwent past New Norfolk, through Bushy Park (where they grow lots of hops), and around the rolling hills, closer and closer to the mountains until you come to Westerway; a small town supplying the nation with its blackcurrant requirements over about 30 hectares, with a few hectares given over to luscious raspberries and sour gooseberries. Despite how much I love summer berries, given our late start we thought it better to stop on the way back. Turn left again at Westerway as signed and follow Gordon River Road (Ginger Creek is now on your right) for a few more kilometres to the park’s entrance. If you haven’t noticed the old railway tracks running alongside and crossing the road multiple times by the time you’ve arrived at the park’s entrance you must have been asleep the whole way (if so, I hope you weren’t the driver!). There used to be a train servicing townships from Bridgewater (the suburb on the north-side of the bridge over the Derwent that you’re most likely to cross if you’re driving up the Midland Highway to Launceston or Devonport) through to, and just beyond, Westerway. The trains would also bring logs back to the paper mill at Boyer (read more here). It would be nice to have trains operating in this part of the state again like they do on the west coast. Our train ride on the West Coast Wilderness Railway was a real highlight from a previous trip. When you reach Mt Field National Park (about 7.5km from Westerway), drive past the picnic area about 400m and the Visitor Centre is on the right. It’s signed; you won’t miss it. There’s a cafe/shop there too. As we already had a Parks Pass you may wonder why we bothered to stop at the Visitor Centre. 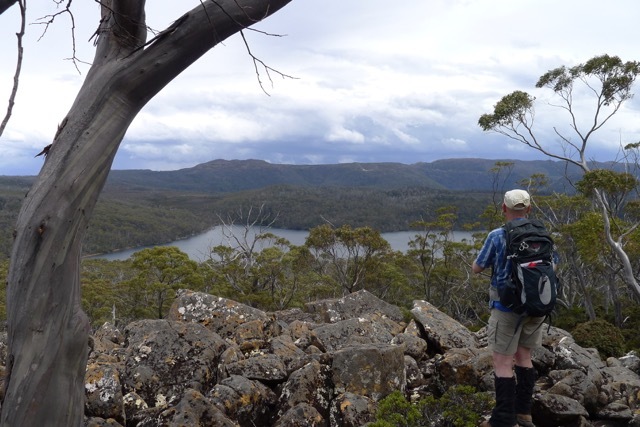 Besides simply being interest to have a look, we wanted to check the condition of the road up to Lake Fenton and even more importantly – to log our walk. The sign in book for all walks is just outside the front door of the Visitor Centre, so before leaving I duly logged our intended walk – Mt Field East circuit from Lake Fenton Car Park. We hadn’t stopped long, but as we walked back to the car Stephen pointed out the clouds which were coming over the range above us were thick and black. Despite this, we headed off along Dobson Road into the Park. It wasn’t long before it started to spit, and as we climbed the slightly corrugated (dirt/compacted gravel) winding road up into the mountains, it soon turned to sleet, then small hail was bouncing off the windscreen. We watched the temperature fall to around 10oC, which had me hoping that what I was wearing would be warm enough! The hail had passed and changed back to a light rain by the time we’d driven the 11km to the small car park near Lake Fenton. We were lucky – there was one spot left. We got out, put on our Gortex jackets… and then the rain stopped. Typical. Regardless, we took or wore everything we’d brought with us. For once we hadn’t over-packed! The short track to Lake Fenton starts at the top corner of the carpark. Summer is a great time to visit Tasmania – so many plants are flowering. I felt like I was in heaven before I’d taken 10 steps! Lake Fenton is part of a catchment area supplying drinking water to Hobart. As such, recreational activities such as camping, boating, swimming and fishing and not allowed. After reaching Lake Fenton we had to stop and refer to the walking notes (a couple of times) to make sure we were setting off along the right path. Cross the outlet pipes and follow the track over the wall and around the north side lake until you come to a sign (a very weathered one on this trip) marking the turn off to Seagers Lookout and Mt Field East – but while there may be, or at least was, a track that continues around the northern edge of the lake, the water catchment committee and Parks & Wildlife Tasmania are trying to discourage people from walking that track. The Seagers Lookout/Mt Field East Track that we were taking is quite clearly well used, and there was little chance of us missing it at this point. Under grey clouds the forest seems to be leached of colour. Then Stephen pointed out that the spots of white on the ground, which I’d taken to be petals or leaves, were actually small hailstones. The track climbs steadily, but not steeply, up to the junction to Seagers Lookout. Had we started walking earlier maybe we would have done this side trip. As the sign there indicated it would take more than an hour to return to this point we chose to continue along the Mt Field East track. Lake Fenton can be seen as the trees give way to a small swampy area. I was surprised, but also very thankful, to see the boardwalk – the ground looked very boggy beneath. Not something I would care to step in. Before long you’re back on rocks and climbing up, past some very impressive boulders, to cross a boulder field. This was where we had our best view over Lake Fenton and south-west toward the Mawson Plateau and Mt Field West. Glad I’m walking over, not through, that bit! The area between the boulder field and the top of the hill is quite marshy – I’m not sure if it’s technically a small moor or not. There are plenty of woody shrubs to about 1m tall that do not appear to be present on the large moors. While very wet, you can mostly avoid stepping in and muddying the water as there are plenty of rocks forming the track through this section. No need for more boardwalk. Old Man’s Beard – I’m not sure what it’s species name is here – I certainly hope it’s native! Entering the shelter of trees on the other side, the track rises over, then follows the curve of the hill around to the left. It seemed a never-ending display of wildflowers and other flora were just waiting to be discovered. We passed by spiky lawns of Pineapple Grass (Astelia alpina) which were just starting to flower, and through banks of Scoparia (Richea scoparia) in all it’s colour variations, which delivered us to the edge of Windy Moor, whereupon a wave of nostalgia swept through me. Gazing upon the browny-green moor, with Mt Field East in the distance, and low, grey clouds overhead, I felt like I was back on the Overland Track. I felt like I was where I longed to be. I felt like I was home. And I knew precisely what was ahead of us. There’s no boardwalk, or even duckboarding here. But then, there aren’t crowds of tourists trampling all over the place like a herd of Brown’s cow’s turning everything into muck, either. If you haven’t got gaiters on already, now is the time to don them (or kick yourself for leaving them behind) ’cause you’re about to find out just how water- and mud-proof your hiking boots are, and when some of the ‘puddles’ are more than ankle-deep, you’ll want those gaiters. With only a small, tree’d hillock providing a windbreak, there’s no prizes for guessing how Windy Moor got its name. The clouds had not cleared from the previous storm front, yet the westerly wind was intent on pushing more rain clouds in our direction. A lot of work must have been done to create the stony path across the moor, and indeed much of the whole Mt Field East track. 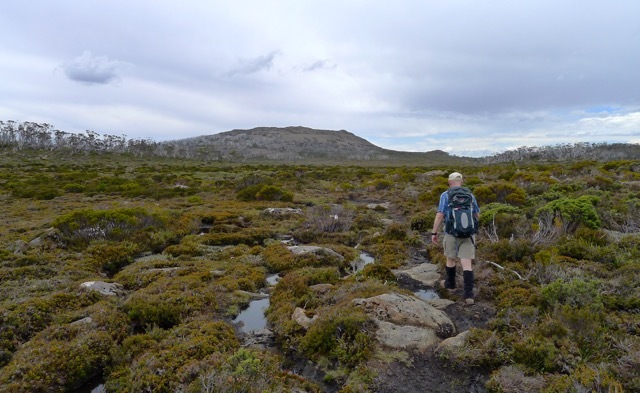 I’m not sure how much the Friends of Mt Field Landcare group are responsible for (whether it’s more maintenance, or everything) but their work for the benefit of all bushwalkers cannot go unthanked or unappreciated. Sticking to the rocks on the path (though not always possible) will help prevent damage being done to this most fragile of environments. A footprint can scar a cushion plant for decades – if it ever recovers. Cushion plants are actually a community small plants rather than one large, spreading plant, and they’re quite often composed of more than one species. Their dense outer foliage is what protects the plants from the elements and allows them to survive, grow, and reproduce. This cushionplant may never recover from being trampled. If it does, it could take decades. Heath cushionplant (Dracophyllum minimum) with something else poking through? Despite the earlier storm, the edge of the moor was quite distinct as the track became a lot drier and tree’d at the base of Mt Field East. Now sheltered from the wind blowing across the moor we were befriended by a cloud of midges. Rather more numerous than those met earlier on the walk, and so rather more annoying. I was glad we had insect repellent mixed in with our suncream, but I wasn’t sure how long its effectiveness lasted. Climbing to the summit of Mt Field East is possible by following a series of cairns. You’ve got to keep your eyes open and stick to the track, apparently. Well, we had our eyes open, alright – we’d been watching another bank of clouds approaching from the west. A couple of bolts of lightning dispelled any regrets I may have harboured about coming this far and not at least attempting to climb to the top. We weren’t the only ones on the track that day, it seemed. As we turned to continue on to Lake Nichols we saw two other walkers making their way down from the summit as the storm approached. We didn’t stop to watch them, but followed the track to the trees disappearing over the edge of the plateau, trying to hurry along whilst still taking a moment to appreciate the view. Moving down through the forest involves a bit rock scrambling across a couple of screes, but as on the climb up above Lake Fenton, the path is marked by poles and is not hard to follow. Although a little steep, footing is quite sure along the track as it remains fairly rocky. Further down towards the lake the path does become a more soil than rock, but it wasn’t muddy. Still, we were walking in summer. Winter and spring conditions are probably much wetter due to snow/melt. What really caught my attention along this section of the circuit was the incredible diversity of mosses and lichens growing on the trees and rocks in this protected area of the park. I noticed some above, earlier, but I was probably more distracted by the diversity of wildflowers. Here it was like exploring a coral reef, but a terrestrial one – a world of unusual colour and form and things that look like plants or branching corals but aren’t either. What a marvellous host tree! Fortunately, the answer was ‘not far’, because as it turns out I was just a short walk from the Lake Nicholls hut. Chapman notes that it makes good shelter in wet weather, and yes – we can attest to that! We were grateful for the opportunity to take off our packs, hang up our wet jackets, and sit down somewhere comfortable and dry for lunch. After crossing the outlet stream to the lake, there’s a very short rise up to a rocky ridgeline that the track follows for a good kilometre or so. Now walking through wet sclerophyll forest there are fewer types of flowers blooming, but the diversity of other vegetation was getting better and better! Good thing we hadn’t taken off our gaiters because soon enough we came across another wet section of track. It doesn’t last too long, and the puddles weren’t too deep. The slope of the track increases as the track descends towards the Lake Dobson Road. The first turnoff to Dobson Road marks the lowest point of the circuit. Our walk didn’t exit to the road along this quite steep looking track, but continued uphill on the same track towards the Lake Fenton Car Park (as signed). The path is very lush, mossy (‘bryophyte-y’) and provided a nice view of Mount Monash directly ahead as the clouds lifted. A newer wooden sign (the wood was still brown when we were there!) at the next bend in the road leads you up a short track to meet the road a turn or two closer to Lake Fenton Car Park. The bleached, silvery grey, twisted tree trunks against the grey, jumbled dolorite boulders is quite a contrast to the green forest we’ve just emerged from. When you step onto the road this time, there are no more shortcuts – it’s simply a matter of following the road back to the start. It was about 1km from the forest to the carpark. Given the weather and time of day it’s not surprising we were only passed by a couple of cars. The most surprising part about this walk was that the road is lined by Fagus! They grow quite tall and bushy in protected spots. I really was quite astonished to see what I had thought to be – if not a rare plant, then certainly one that required effort to find – growing so happily beside the side of the road. Although it was getting late by the time we made it back to the Visitor Centre and logged out – it was closed, but that’s why the log books are kept just outside – we still (just!) had time to stop at the raspberry farm at Westerway for some fresh fruit and an ice-cream. We got talking to one of the members of the family who own the farm and it turns out that they’re the last growers of blackcurrants in the country! Growing up in Queensland, blackcurrant juice (or cordial) wasn’t something we drank as kids, or that I readily identify with but, by the sounds of it if you grew up in Tasmania or Victoria it’s something you may become quite passionate about. Not just where the berries are grown, but also the percentage of juice being used, trademarks on recipes and brand take-overs. Ice-creams finished, we were back in the car for the drive home. As the weather hadn’t cleared the grey clouds made a dramatic background against the rolling countryside as we drove back down the valley. Tasmania is not just scenic around the edge. Like most of the roads in the state, the road is single carriageway until you get closer to Hobart, but the surface was pretty good. The first book is a very good field guide and although I found the second book very useful, there are some notable gaps in the information contained, for all its’ nearly 400 pages of species photos and descriptions. Unfortunately, I haven’t – yet – bought a field guide to Australian bryophytes, and since we have over 2,000 species of them it’s not a simple matter of Googling the answers, especially if you’re not sure where to start. I’ll endeavour to come back and update the titles of these photos once this situation has been remedied. Identifying species in cushionplants has also proved to be somewhat challenging. I’ve done my best, but if anyone thinks I’ve mislabeled something, or if I haven’t been able to identify it myself, please – let me know! Categories: Hike, Tasmania | Tags: Bryophytes, bushwalk, bushwalking, Cushion plants, day walk, driving, fagus, Ferns, Heath, Hike, Hiking, Hobart, Lake Fenton, Lake Nicholls, Moor, Mt Field East, Mt Field National Park, Nothofagus gunnii, Tasmania, Tasmania Parks & Wildlife Service, Tasmanian native plants | Permalink. ‘Really? How do you know that?’ I thought to myself, fighting down a childish impulse to resolve not to go – or if I end up going (dragged, kicking and screaming – metaphorically, of course) to not like it, simply to prove them wrong. Unsubstantiated claims get my back up. But on this occasion, they turned out to be correct. I started to think there might be something there worth seeing after reading this post from Jules, who was visiting with her family (also from Melbourne). If, at the end of this, you think you might also want to visit, then my first tip is: if it’s peak season (i.e. 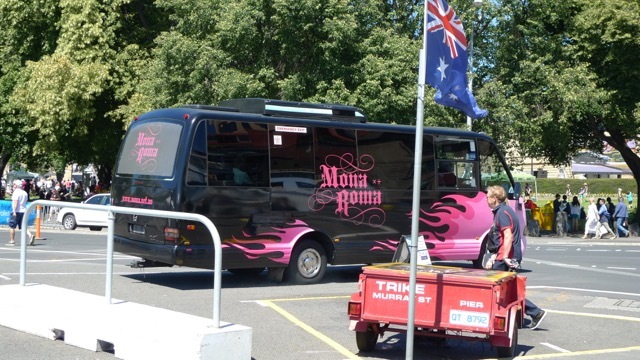 school holidays) don’t queue up at Constitution Dock to catch the Mona Roma MR-1 (catamaran) 15min before it’s due to depart and hope to get onboard. You may be lucky, but you are more likely to be disappointed. Purchase your tickets in advance – at the ticket booth or online. 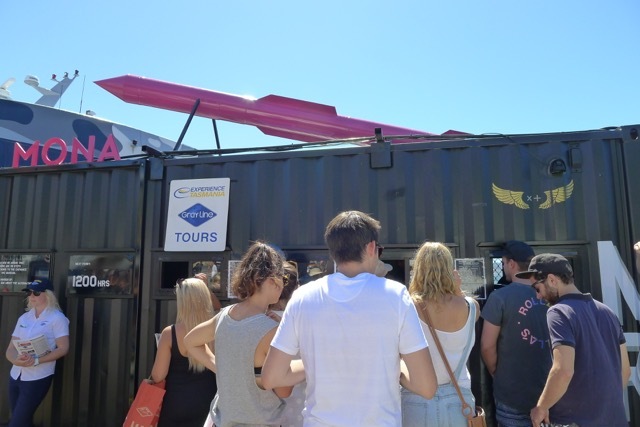 Lining up to buy tickets for the MONA ROMA MR-1 at the booth at Constitution Dock. Tip two: Buy tickets for the Posh Pit if you can! Most of the yummy morsels served on the way to MONA – two didn’t make this photo! The ‘gold’ couch on the front deck for Posh Pit-ers. Great when it’s not wet. Serenaded with background music striking just the right tone and volume, a few glasses of bubbly and a shared plate of truly delicious morsels later, we arrived in just 30min at David Walsh’s dungeon known as the Museum of Old and New Art (or ‘MONA’ to everyone) to explore the diverse collection, and attempt to use the artwork as life-sized images from a 3D View-Master to peer into David’s mind. Disembarking from the MR-1, passengers are confronted with the 99 steps leading up to the mirrored entrance. I would have liked to have taken a little more time to appreciate the atheistic of this section (and that was before I read about the amount of consideration that went into their design! ), but it started to rain again so we hurried along with everyone else. We already knew that the museum starts at the bottom, but the main entrance (and lockers for backpacks and umbrellas) are on the top (‘ground’) level with a shop and cafe that enjoys very good views across Berriedale Bay to Mt Wellington to the south, and along the Derwent River to the east. Having presented our MONA tickets (purchased with our return ferry rides on the MR-1), we descended the spiral staircase in the middle of the building. You probably know by now; I love rocks. I’ve mentioned it before, usually as justification to post photos of forests full of huge granite boulders. Well, have I also mentioned that it’s not just outdoor rock, but indoor stone that I love? They didn’t intend the building to be an attraction, but Stephen and I agree it’s probably the ‘installation’ most worth viewing. Built on a tight budget, the architectural style is ‘industrial’. Some people may be turned off by the concrete floors and pillars, the exposed concrete waffle slab ceilings; but I liked seeing the bones of the building. And I’m not turned off by brutalist styles, which might help. If not thought through properly this style might look unfinished and poorly constructed… but here, they’ve made it work. And there’s no way – no way – they could ever have allowed that huge and stunningly gorgeous Jurassic sandstone to be disguised. Perfectly illuminated, it brings warmth, life and colour to what might otherwise be perceived as a stark and artificial subterranean environment. Having queued and received our iPods and instructions on using the The O app, which provides various explanations of the artworks, we gave the Void Bar a miss (having indulged on the ferry, more alcohol was hardly required at this point) and entered the first exhibition on the lowest level, ‘River of Fundament‘. My very first impression was ‘how much time are we going to spend looking at The O instead of at the artwork? Fortunately, you can save and email your tour to yourself (and share it with others), so you don’t have to spend your whole day reading all about the pieces and the artist – that can wait until later. The perfect utilisation of modern technology. The O works thanks to lots of Real Time Location Services (RTLS) devices on the ceilings. Which also means your smartphone works, even though you’re three storeys down and under a lot of concrete. Nice work guys! In contrast to the hidden, mood lighting outside this gallery, the exposed rows of fluorescent tubes lighting the cavernous spaces in the ‘River of Fundament’ exhibition created a warehouse basement feeling to the space as we wandered between groups of people loosely clustered around each art object. I found myself reflecting on the right of individual collectors to own ancient relics. Sure, these objects are (currently) on public display, but was it right to take them from tombs (not everything is from someone’s tomb) in the first place? “Osiris – Five Points Make A Man” – Why the pannels from an outer coffin beneath? 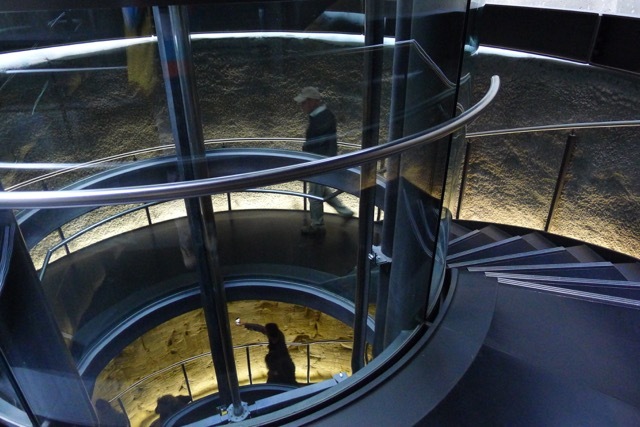 On the whole I was happy to emerge from the gallery, especially since were back at the sandstone wall again. This small space is just exquisite with water seeping at the top of the wall making such vivid contrasting colours on the rock. To me this is room of blank paper is about knowledge, learning, ideas, history and the future. Like something out of the Matrix, there are short sequences of binary code on blackened walls, lit only by wells of super-bright LED’s from the edges of the floor. There is a secret message to find, and a surprise, too. I like colours, and in a building with no windows any colour is good. At first the 46m long mural may look like it’s all the one picture repeated over and over, just coloured differently, but you should take a closer look. Inconspicuous and unobtrusive were the staff watching over every piece of artwork. There was plenty to see even with a couple of spaces closed pending new exhibitions. We didn’t even see everything; my head needed a break after 2 hours of plumbing the depths of MONA. Outside, across the tennis court (because – why not?) and up the steps is Moorilla winery. On the lawn on the opposite side of the winery, preparations for New Year celebrations were being made with a stage and outdoor food and drink serving facilities being set up. Why a tennis court? Why not? In addition to The Source restaurant, there is the Wine Bar where visitors can pick up a light (or filling), quick meal. We enjoyed a shared vegetarian antipasto platter with a glass of one of the ‘house’ whites each. (I apologise for the poor description – I didn’t order lunch or the wine and I don’t remember which label – probably Muse – or grape variety it was – possibly riesling.) It was a lovely, relaxed lunch – but it was very busy in the Wine Bar; we were lucky to spot a couple of stools to commandeer along the wall near where the chef was deftly putting lunch orders together. The weather had improved for the ride back on the ferry so I stood out on the front deck and admired the scenery. Unfortunately missing out on the sweet treats served to Posh Pits guests. When I popped in to see if they’d been handed out, all I found was an empty plate! At least Stephen enjoyed them. We pass the Incat shipyard where the MONA Roma MR-1 was made. That cat is a LOT bigger! Departing from Constitution Dock at 9:30am and arriving back at 2:15pm (catching the 1:45pm ferry from MONA), we had plenty of time to look at everything we wanted and enjoyed an unhurried lunch. Taking the first ferry for the day also meant we had time to do other things in town when we got back. I am very pleased we made time to go and see MONA. Categories: Holiday, Tasmania | Tags: Ancient Egypt, architecture, Art Gallery, artefacts, Hobart, Jurassic Sandstone, MONA, Moorilla, museum, Museum of Old and New Art, River of Fundament, Tasmania, winery | Permalink. It’s all just memories now… But damn fine ones, I might add! After an absence of way too long (just under 2 years) we were BACK! And Hobart over Christmas/New Year is THE place to be when you’re in Tassie – even if you’re not a ‘foodie’, even if you’re not into sailing, even if you ‘don’t get’ art, and even if nature gives you a rash… there will still be something here for you to do and enjoy. TMAG makes you think – love it! Our base for five nights in South Hobart was the Fireman’s Loft, a small apartment for a couple decorated with firemen-themed paraphernalia to pay homage to the buildings’ history. The Fireman’s Loft is either a 20min walk or a 5min drive/bus ride into town. In Sheffield we stayed for two nights at the Kentish Hills Retreat (motel) which was clean, comfortable and an easy 5min walk to town. We would have liked to spend longer in Hobart. There was so much that we were hoping to do this trip that we just didn’t have time to squeeze in. Trips to Port Arthur and Bruny Island spring to mind, exploring the Huon Valley (south of Hobart), visiting the Maritime Museum, finish looking at everything in TMAG (because even after two visits we still didn’t see everything! ), restaurants, wineries – not to mention revisiting places we’ve previously been, such as the Royal Tasmanian Botanical Gardens (which are lovely and definitely worth a visit). But we were lucky to get five nights between two other bookings at the Fireman’s Loft – and I made my booking 11 months in advance! As I have previously said, if you want to visit during the summer holiday period, you have to book well in advance! You know, when people ask me what I like most about Tasmania and I reply “Everything,” I really do mean everything! Categories: Holiday, Tasmania | Tags: Callington Mill, Fireman's Loft, Hobart, holiday, MONA, Mt Field, Mt Roland, Mt Wellington, Oatlands, Ross Village Bakery, Salamanca, Salamanca Markets, Spirit of Tasmania, summer holiday, Tasmania, Taste of Tasmania, The Cherry Shed, TMAG | Permalink.